Next best thing to having a real fireplace with the sound of wood burning. Thinking about purchasing full version. 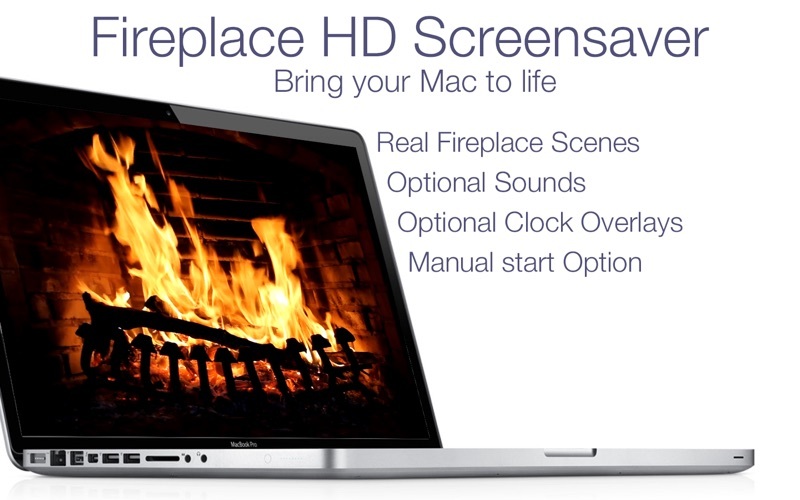 I love this fireplace screensaver. It feels so warm during this cold winter. I looks realistic and feels like I’m sitting in front of a real fireplace. I love this. I use this in my classroom during my Holiday around the world unit. I would like to see more scenes. i can not show the ones with adult beverages. I would like to see an irish setting or snow windows in the background. Maybe some music with it . I upgraded to the full version and love it. Needs option added to allow display on a second monitor while the mouse is still active on the primary monitor - and vice/versa. As a child we had a fire place. I loved it. Now I live in an apartment and have for many years, no fireplace. The same for most of my friends. But now a have a fireplace with this app. It is fantastic. 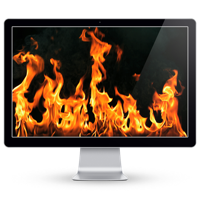 Put your device on top of a heater in the winter and ta-da you have a fire proof fire place. Ahhh its so wonderful and this fake fireplace just gets me feeling colder and broker that I don’t have heat for my home…. Anyway it’s dope af to stare off into if leave your screen idle for some time. This looked like it was going to be a fun app for Christmas, but it would not open at all. I’m on a Mac Mini (late 2012) running El Capitan 10.11.2. If I’d paid for it, I’d be pretty ticked-off. But if this is supposed to be a sampler trying to entice us into buying the ‘full’ version, it is a FAIL. - Sorry if the truth hurts! very cozy scene and we swear the room is warmer just looking at this fire and hearing the crackle and pops but I had no idea there was a smell involved Have not had that experience. I only gave it 4 stars because of the ad that pops up in front of that great roaring fire. It is irritating and when you click it off you lose your fire for how ever many minutes you have it set to come on. However it does not re-appear and that is very nice. Plan to buy this app but was trying it out first to see if it was worth it. I really believe it is and would recommend it to everyone. I will come back for that 5th star after purchasing this app if the paid version lives up to its praise. Thank you developers for an awesome app. J.W. Ecellent ash to flame ratio, realistic flickering effects, great for a hoedown or even a hootenany. No labour required. 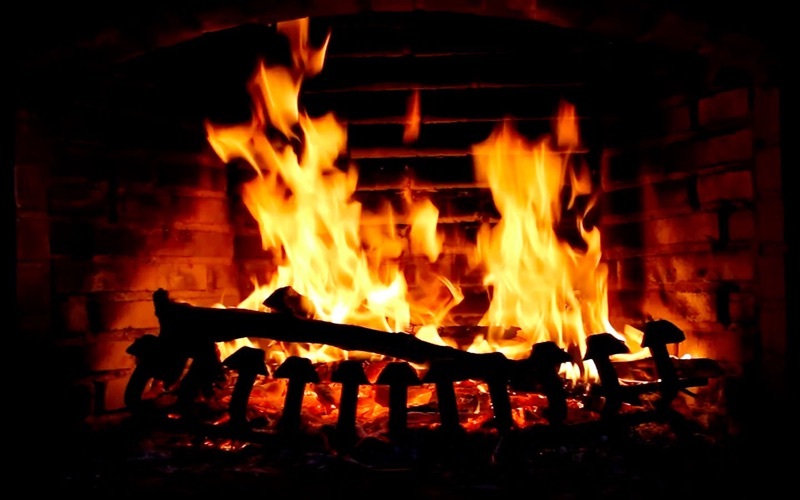 Living in Florida, you seldom need a fire - but this is so romantic, without the heat! Love it!!! 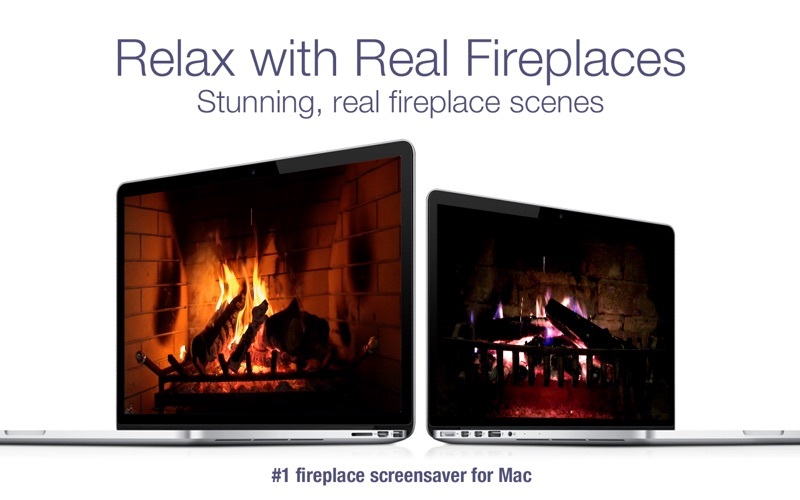 What a treat - now you can have the beauty and relaxation of your own fireplace anywhere. And how nice to be able to choose from 8 different settings ! Makes any room cozy and serene. I use in the nursing home when visiting my mother-in-law. Wonderful ! Tried to project this to our AppleTV which worked, but after running for an hour or so it seems to have heated up the Macbook Air so much that it rebooted. Happened consistently. I didn’t contact support since we only needed this for one evening. You may have better success with other hardware. By I paid for it let me use it! 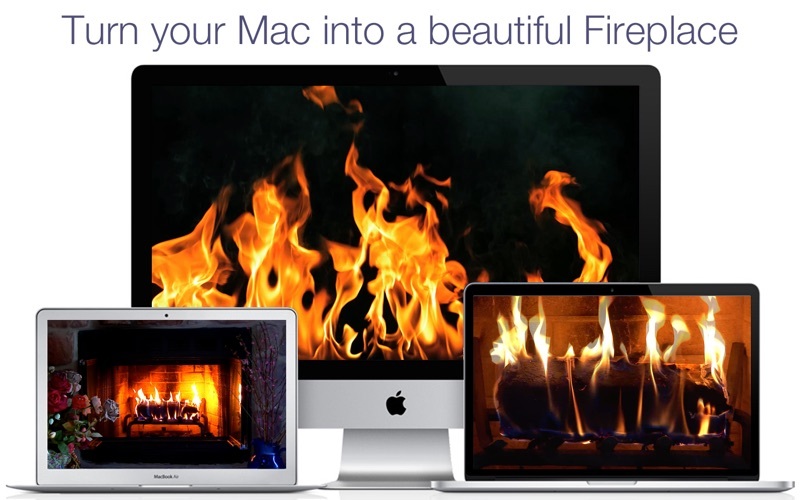 I’m ready to throw my Mac into the fireplace! Being from up north, living in the south, this is so realistic, I can feel the heat coming off it. Kind of like the fireplace I had in Delaware when I lived there. i love this fireplace, and it gives you so many options. It’s great! Since, I don’t have a real fireplace this is beautiful. Very romantic on cold nights. This is THE choice for a winter night - fall as well. Thanksgiving, Chanukah, Christmas Eve - with some faint crackling sounds added in, my Mac is part of the holiday decor. Thanks for this great app. its very good quality, but I wish it could be used as a screen saver. Hey if you like romantic evenings with the person you desire then this is the app you should have, in the car, house, apartment, hideout, plane, backseat, Yep this the greatest Fire app I have seen…. I enjoyed this screen saver for two days until I happened to notice that it left ghosting on the lower left of my iMac's screen where the bright spots on the log are located. Screen savers are supposed to be designed to avoid this problem, not cause it. I removed it immediately and haven't used it since. I watch this with a Samsung Synmaster T240HD, and listen through a Harmon Kardon speaker/subwoofer system. Wow, what a great combo! The real thing would be nice, but this is almost as enjoyable as being there! A great app - get it! Downloaded this days ago,and got many compliments! I turn off all lights in my room,and display this on screen while falling asleep to the crackling sound,it is,so relaxing,and soothing. I don't use the audio feature, but all the fires look great on my monitor. It's a nice visual to see in the middle of winter. This is a really cool app! Really enjoyed the Classic Fireplace. Please include the 1080p resolution in the next update, please! I'll even buy the paid version with the 1080p version! when i look it fireplace make me relax!!! And happy also! I installed this on my MacBook and love it. It gives you such a warm pleasing feeling of comfort. It has worked well with out any problems. Give it a try you will probably love it especially this winter. I work in Miami half the month and find this to be great for making feel as if I'm back in Manhattan. It is so soothing. I love this app so much I put it on my iphone and use it with my nieces and nephews for sleep overs. Love this app. The sounds and picture are so realistic, you feel warmer sitting nearby. Think it is neat. Thanks to the developer. It's great! It's got the look, and sound of a real fireplace! I love it! I love this app, I sometimes forget I have it until it turns on. I love the real sound it makes. The screen is beautiful also. I have a big 27" Mac and the computer is in the corner of my kitchen. Everytime I come into the kitchen and see the fire going, I smile. It is warm and inviting and so realistic. Just lovely. the scenes and sounds are very relaxing. decent amount of choices. the HD looks great. don't see much use for it overall though, but it isn't a bad app. For the reviewer who said she couldn't get it to work you have to click the little flame at the top menu bar next to wifi, sound and all of that. Then under preferences you can select which image you want displayed. Even crackling sounds. Pretty cool. Perfect amount of flickering light to warm a dark room at night. Problem with having to reload it from my Applications folder as it vanishes from my toolbar every few days. In spite of that, I like it so much, it's worth the time! 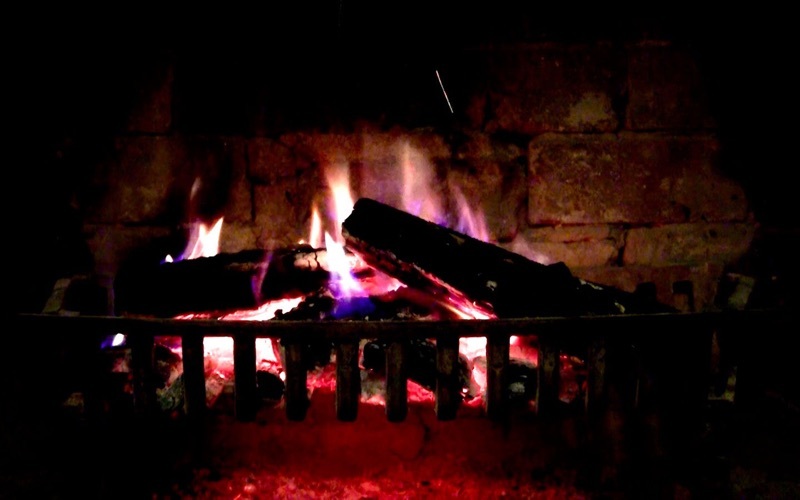 I grew up with a fireplace in my home and when I wanted to relax, I would just sit in front of the fireplace and watch the beautiful flames for hours and then I was ready for my day…This reminds me of those days and I love it. At this point you have choices and I love the candle lites. Free version worked perfect, never noticed any adds. Fun App to have, especially on a grey, winter day. Hopeful!!!!!! I feel like I'm in front of a real fire. I actually start feeling warm. I gave it four stars because… well, I think it's messing with my head. psych wise. Just on the fact that, it really makes me feel like I'm in front of a real fire. I'm not sure some of the times because when I get tired & fall asleep; I wake up startled. I get a bit scared sometimes at first, until I come to…thanks & happy new year. I have had this app running on both my iMac and Macbook Pro for the month of December. With the sounds of the crackling fire, I almost think I'm back in snow country instead of the Arizona desert flatlands. I enjoy the animation, it is very realistic. Really nice. Love the sounds.